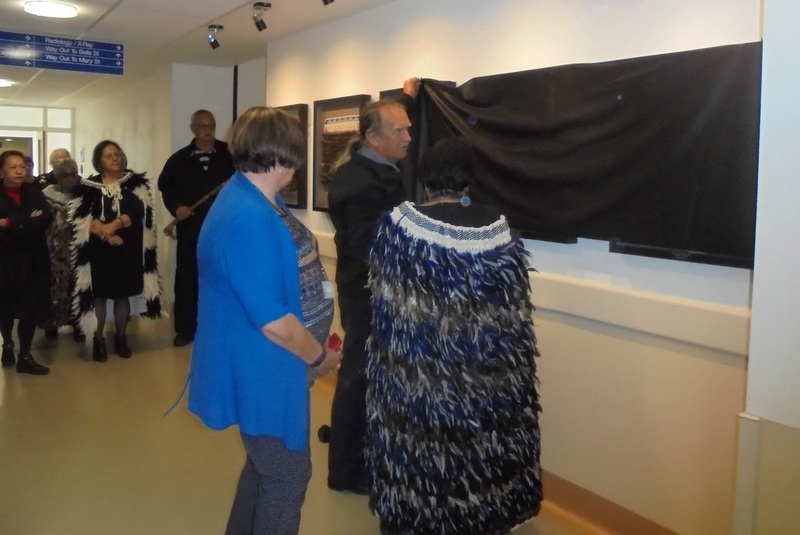 At 10am today, Tuesday 30 October 2018, a spectacular new display was added to the taonga that line the ground floor corridor at Thames Hospital Te Whare Hauora o te Kauaeranga. Maata McManus standing left of the Korowai, and Wati Ngamane at the right end. 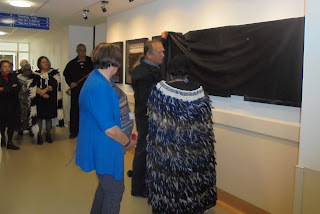 During proceedings Mrs McManus revealed that it was a very special time for her, as just the day before she was in Wellington and had received the great honour of being awarded a Commonwealth Point of Light Award for her inspirational work teaching the traditional art of Korowai. 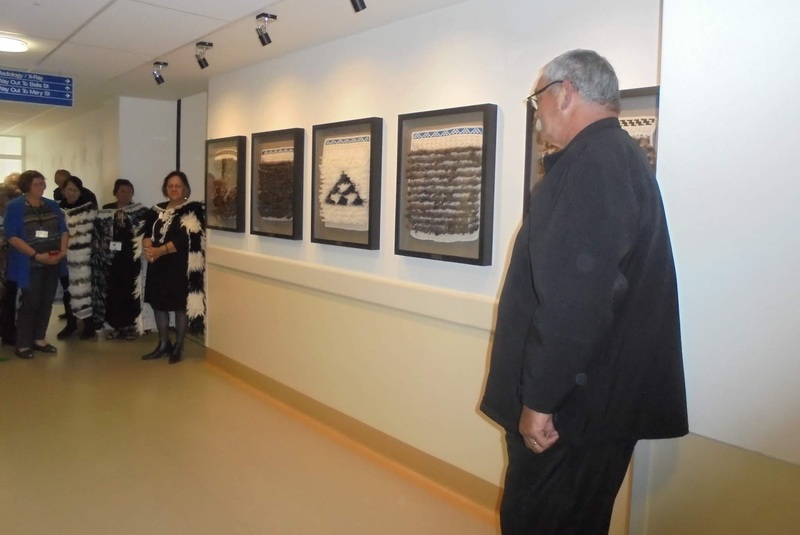 "Maata McManus, representing New Zealand, is a pioneering health worker who is using the ancient Maori art of weaving traditional feathered cloaks to reach local women in need of care and support." UK Prime Ministers Office. The women recalled that they had made many cloaks since the being taught the art of cloak making by Maata. The feathers came from several species of birds including pheasant. 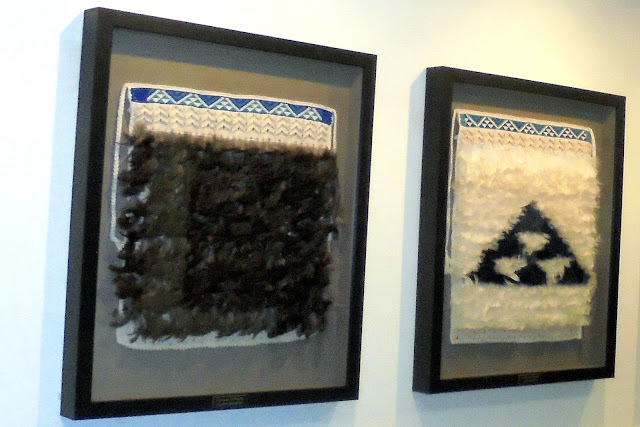 Two of the Korowai in the new collection. 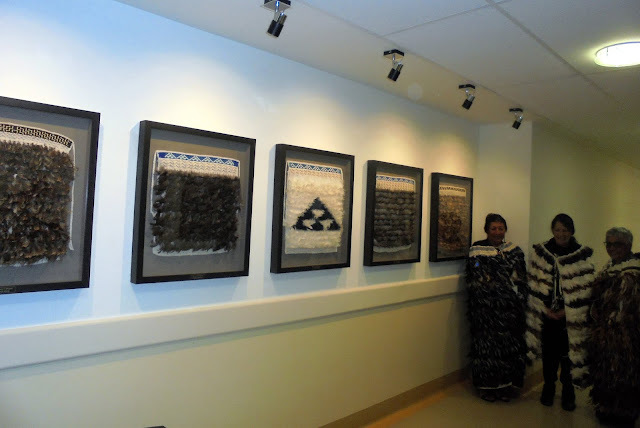 The photographs above of the Korowai weavers and their supporters. Its finally done, another item ticked off the Thames Hospital 150 checklist. 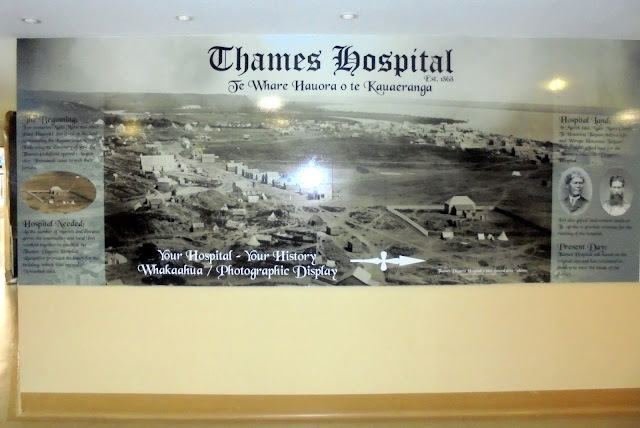 Apologies for the poor photographic effort, but here is the latest addition to Te Whare Hauora o te Kauaeranga - Thames Hospital. The 4.4m mural shows Shortland Town at the end of 1868, with the Thames Diggers' Hospital on the far right (surrounded by a fence). The mural is located on the north wall, off the main foyer, from the Mackay Street car park. 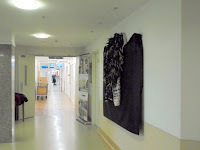 The 'special wall' encourages visitors, patients and staff to wander along the corridor and view all the photographs and memorabilia on display. This brilliant design is by Clint at KMG. Plus special thanks to Clint and Reon who worked late to apply the print to the wall - a job well done by KMG Print, Thames. 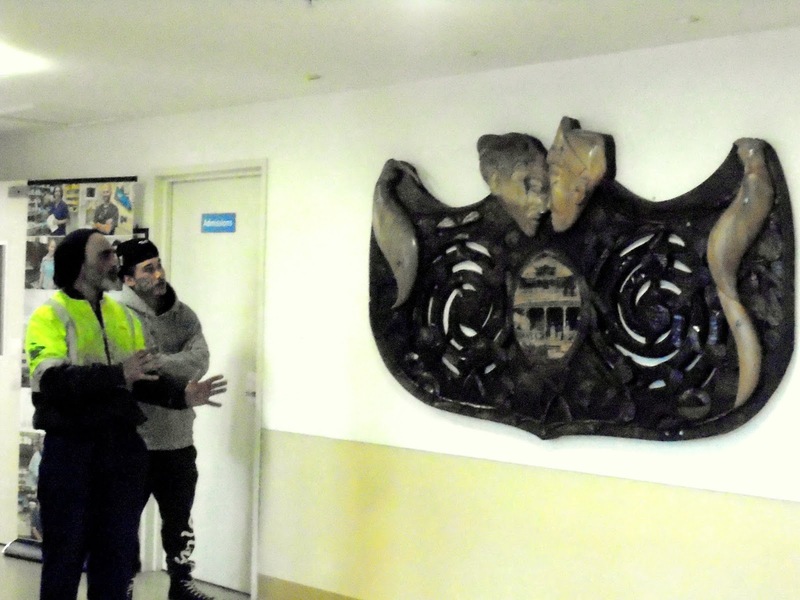 This Tuesday 30 October 2018 at 10am, five framed Korowai will be blessed and added to the Hospital's collection of taonga. The Thames Hospital 150 Commemorations are nearly upon us. 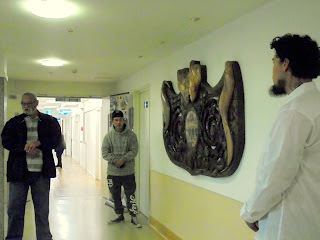 Here is a short slideshow about the hospital which shows a few building events over the decades. The Thames Hospital Commemoration Slideshow is available to view now. Thames Hospital, Baillie Street Thames c1910. PS. At 11am Saturday 20 October there is a new display opening at the Thames Museum that also celebrates Thames Hospital 150 Years. 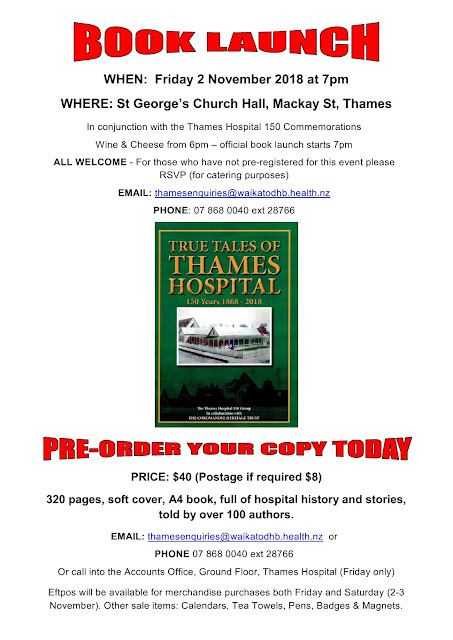 Remember the book "True Tales of Thames Hospital 1868-2018" launches Friday 2 November. Just $40, 320 pages, a third in colour. Full of history over the decades. You can reserve your copy today. Email the Thames Hospital for further details. October 1918. With the war coming to a close after four long years, there was sadly no let up in the number of war related deaths. 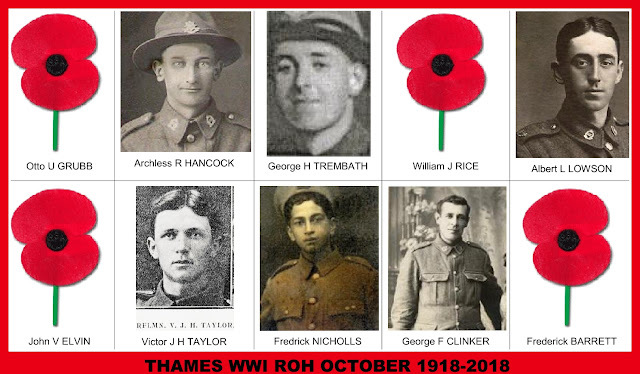 A further ten Thames men were Killed in Action during the month. OTTO GRUBB: Otto was born at Thames, the son of Henry Thomas and Esther Grubb. He went to school at the Waiokaraka and Kauaeranga Girls’ School. On enlistment he was working as a pipe layer for the Auckland City Council. He had served in France from June 1917, and was Killed in Action on 1 October 1918, in the field, France. ARCHLESS HANCOCK: Archie was the son of Rosina and William Hancock, and he was born in Thames and was schooled in Thames. Hancock was only in the field for two weeks, when he was Killed in Action 1 October 1918. GEORGE TREMBATH: George was born at Thames, the son of Francis and Emma Couch Trembath, the family lived in Pollen Street, Thames. Trembath's father was Mayor in the 1900s. 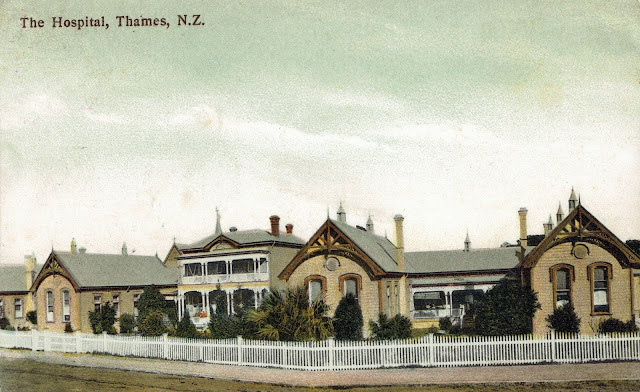 George attended the Waiokaraka School at Thames until March 1907, when the family moved to Epsom in Auckland. He was first reported missing on the 1st October 1918, but a fellow Private reported that “On 1-10-18 I saw 31748 Pte Trembath get killed by a shell near 1st Bn Ak Regt HQ.” Trembath was then named as Killed in Action on 1 October 1918, in the field France. WILLIAM RICE: William went to school in Thames. He was the son of Mrs S Rice of Waihi, and was a labourer at Mangaiti on enlistment. Rice was Killed in Action 1 October 1918. ALBERT LOWSON: Albert was born in America, the family then came to live in Thames (Beach Road). Albert attended the Catholic School, then Thames High School, he then went to work in the Post Office. Lowson was barely in the field for one week, when he was Killed in Action 2 October 1918. JOHN ELVIN: John was born at Thames, his parents were William Robert and Charlotte Elvin. The family lived at Turua, where John was educated and later at Paeroa; before the war, and worked as a labourer for Bagnall Bros of Turua. Elvin arrived in France in September and, within a few weeks, he was Killed in Action on 5 October 1918, in the field, France. VICTOR TAYLOR: Victor was born at Te Awamutu, the son of William Huia and Elizabeth Taylor. Victor was educated in Paeroa, then came to Thames High School. Apart from this time at Thames he had been in Paeroa nearly all his life. He was Killed in Action on 5 October 1918, in the field, France. FREDRICK NICHOLLS: A member of the NZ Maori Pioneer Battalion. Nicholls was born in Thames, the son of Humphrey and Ngahura Tamihana Nicholls, later of Te Puke. GEORGE CLINKER: George's parents were Henry and Johannah Clinker, the family lived in Mackay Street, Thames. He was schooled at the Waiotahi School. When he enlisted he was working at Whakatane. Clinker had only been overseas since 23 April 1918, when he was wounded in the field and died the same day (8 October 1918). FREDRICK BARRETT: Fred was born and schooled in Coromandel. He enlisted in 1917, and underwent training overseas at Sling Camp in England. Barrett went to France in March and was Killed in Action 23 October 1918. His name appears on the Thames WWI ROH Memorial. Thames Hospital was established 150 years ago, today at the hospital, the unveiling of a carving recognised the relationship between local iwi and the hospital. The carving was blessed and unveiled at 9am, 2 October 2018. 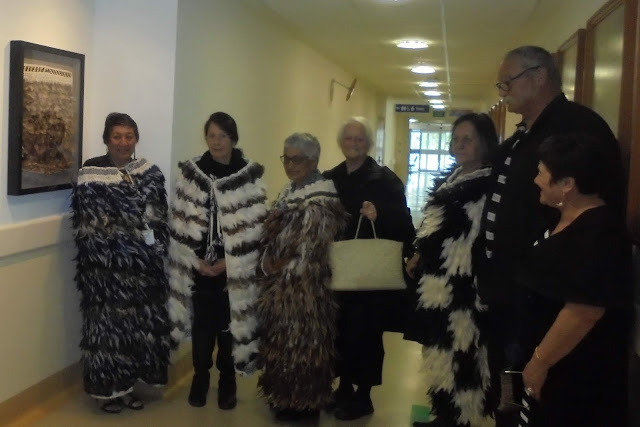 Present were local iwi led by Kaumatua Wati Ngamane and Dr Korohere Ngapo. The carving is named 'Te Tirohanga' and is the work of local carvers. Top left: The blessing begins. 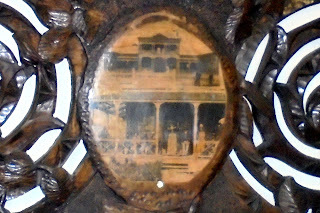 Top right: The carving is unveiled. 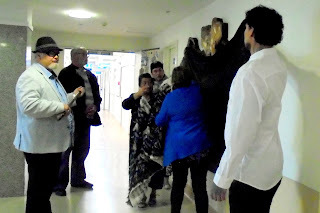 Above: There ceremony continues in the foyer of Thames Hospital. 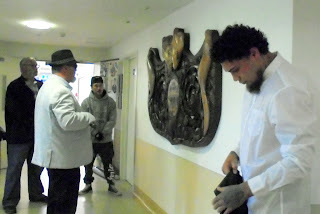 Master carver Darin Jenkins, gave a full description of the carving, which has been done using locally sourced kauri. In the centre are photographs of the Thames Hospital c1900, that give the impression of having been etched into the wood. 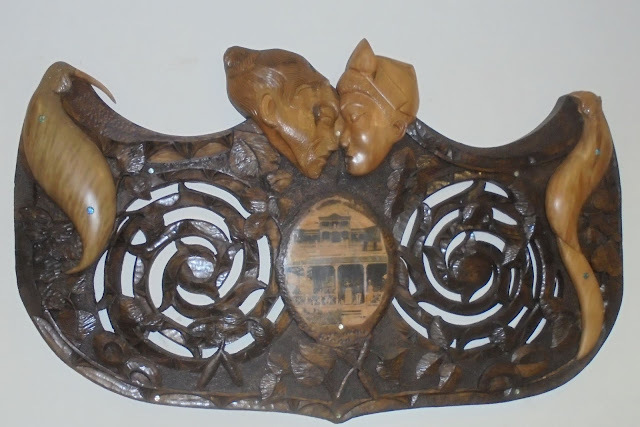 A full description of the carving is available online. "Master carver Darin Jenkins created the piece, together with several other carvers. He said the Pare-Lintel wall furnishing, which hangs in the hospital's main entrance, represented the coming together of two peoples for the benefit, health and wellbeing off all. 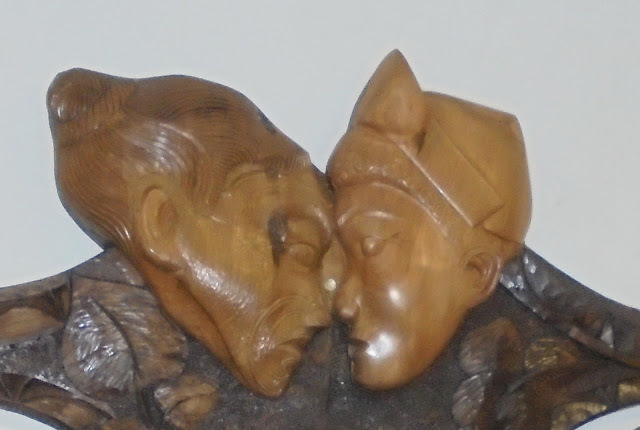 This relationship is shown in the piece by the acknowledgement of each other by the hongi, the pressing together of noses enabling the merging of "Hā ora" the breath of life, the life essence, as expressed in the saying "Tīhei mauri ora". ABOVE: Full view of the carving 'Te Tirohanga'. 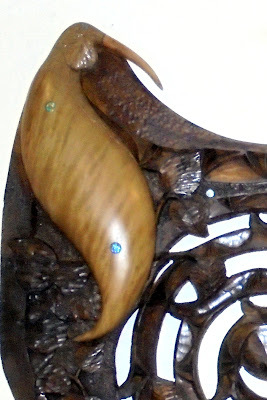 ABOVE: Closer look left at the central photos of the hospital that have been incorporated into the carving, And right the kiwi and query huia combined to represent the native birds of Aortearoa.